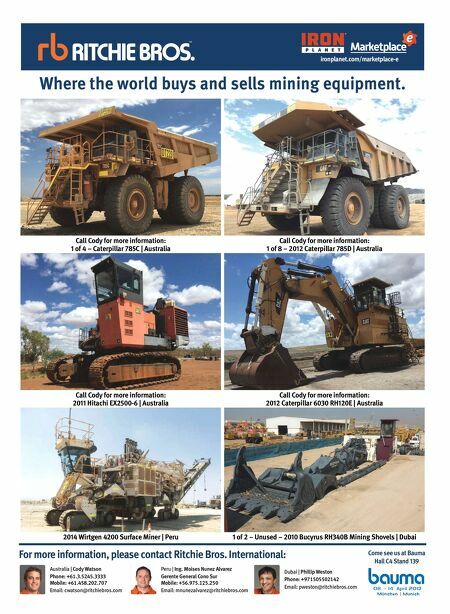 REGIONAL NEWS - AFRICA 18 E&MJ • FEBRUARY 2019 www.e-mj.com Orion to Redevelop Prieska Mine A scoping study has confirmed that Phase 1 of Orion Minerals' Prieska zinc-copper project in the Northern Cape Province of South Africa could become a significant low-cost producer of zinc and copper concentrates. The study outlines an ini- tial 10-year mining scenario, extracting 75% of an underground mineral resource of 28.73 million metric tons (mt) grad- ing 3.77% zinc and 1.16% copper. A 2.4-million-mt-per-year (mt/y) processing operation would produce about 70,000 mt/y to 80,000 mt/y of zinc and 22,000 mt/y of copper in concentrates. Orion is an Australian company head- quartered in Melbourne and listed on the Australian and Johannesburg stock ex- changes. Capital cost of construction of the Prieska project is estimated at A$360 million to A$390 million, including a 20% contingency. The construction peri- od to first mining underground is estimat- ed at about 24 months. Underground mining costs includ- ing labor are estimated at approximately A$48/mt. All-in-sustaining costs are esti- mated at approximately A$100/mt. A bankable feasibility study is due for completion in the second quarter of 2019. Orion Managing Director and CEO Errol Smart said, "The scoping study indicates solid operating margins ... and identifies important opportunities for further finan- cial upside, both from extending the life of the mine and from optimizing the grade of extraction following further drilling to be conducted from underground. "The application of further modern- ization making optimized use of low-cost available renewable energy also provides an important cost saving opportunity be- ing investigated in depth by the bankable feasibility study." The Prieska mine was owned and operated by Prieska Copper Mine Ltd., a subsidiary of Anglovaal, from 1971 to 1991. Some of the infrastructure that serviced those operations is still service- able and can be used for the new project. This includes a 60-kilometer (km)-long bulk water supply pipeline, tarred roads, regional grid power and an airstrip. The main hoisting shaft, which is 1,024 meters (m) deep, and its associ- ated headgear are intact and reuseable. Some 37 km of underground tunnels and mined-out stopes are currently flooded to a depth of 330 m below surface, and an 18-month pumping program would be re- quired to de-water these workings. Tunnels established during previous operations allow for early access to un- derground production areas. A combina- tion of longhole stoping and drift-and-fill mining has been selected as the preferred mining method. Longhole open stoping was successfully employed during histor- ical operations down to an approximate depth of 900 m below surface. Using paste fill and drift-and-fill methods would cater for mining at great- er depths and would accommodate the changing dip of the deposit. Other im- provements on historical mining practices would be the use of a more technological- ly-advanced mining fleet to provide faster tunnel development and more accurate production drilling. Underground development and pro- duction operations are planned to be fully mechanized, with all development head- ings being advanced using twin-boom jum- bos and supported using bolting rigs. Load- haul-dump units would be used to load blasted development and production rock into ore passes in the upper levels and into a truck fleet, which would haul up 1-in. in- clined roadways to the central crusher loca- tion, the excavations of which already exist. The main shaft would be equipped for rock-hoisting capacity of 2.4 million mt/y, utilizing two 14-mt skips. A Koepe winder would be used for rock hoisting and would have a power rating of approximately 1.8 megawatts (MW). A ground-mounted dou- ble-drum, 4.9-m-diameter winder would be used for the men-and-materials cage. The main processes within the pro- posed copper flowsheet are primary crush- ing, secondary crushing, and screening followed by milling, rougher flotation, re- grind of the rougher concentrate, cleaner flotation, and re-cleaner flotation to pro- duce a copper concentrate. The zinc recovery section would start from the copper rougher tails and would include rougher flotation, rougher low- grade concentrate re-grind, low-grade cleaning, low-grade re-cleaning to pro- duce a zinc concentrate, and rougher high-grade concentrate cleaning, also to produce a zinc concentrate. The high- grade cleaner tails would be sent to the low-grade re-cleaner flotation stage. Process plant recoveries would range between 80% and 88% for both zinc and copper. Production would be approxi- mately 145,000 mt/y of zinc concentrate grading 48% to 52% zinc and 94,000 mt/y of copper concentrate grading 22% to 26% copper. 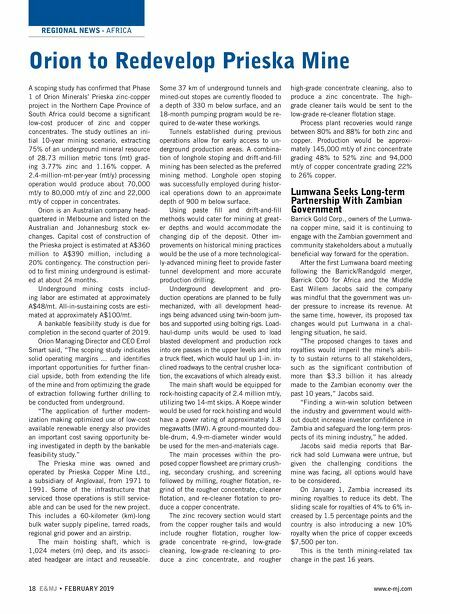 Lumwana Seeks Long-term Partnership With Zambian Government Barrick Gold Corp., owners of the Lumwa- na copper mine, said it is continuing to engage with the Zambian government and community stakeholders about a mutually beneficial way forward for the operation. After the first Lumwana board meeting following the Barrick/Randgold merger, Barrick COO for Africa and the Middle East Willem Jacobs said the company was mindful that the government was un- der pressure to increase its revenue. At the same time, however, its proposed tax changes would put Lumwana in a chal- lenging situation, he said. "The proposed changes to taxes and royalties would imperil the mine's abili- ty to sustain returns to all stakeholders, such as the significant contribution of more than $3.3 billion it has already made to the Zambian economy over the past 10 years," Jacobs said. "Finding a win-win solution between the industry and government would with- out doubt increase investor confidence in Zambia and safeguard the long-term pros- pects of its mining industry," he added. Jacobs said media reports that Bar- rick had sold Lumwana were untrue, but given the challenging conditions the mine was facing, all options would have to be considered. On January 1, Zambia increased its mining royalties to reduce its debt. The sliding scale for royalties of 4% to 6% in- creased by 1.5 percentage points and the country is also introducing a new 10% royalty when the price of copper exceeds $7,500 per ton. This is the tenth mining-related tax change in the past 16 years.